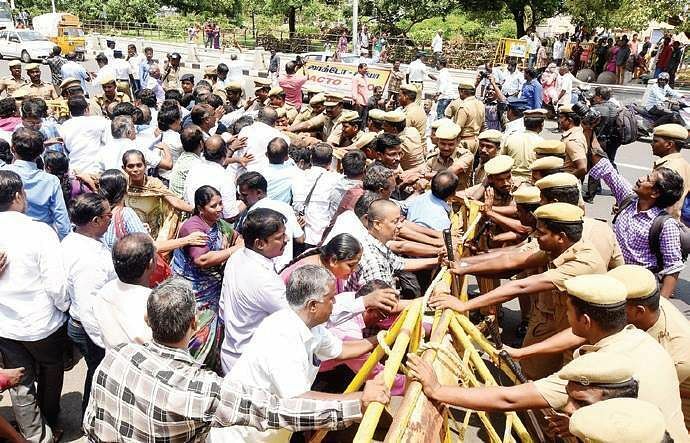 Pulling up the protesting government teachers who are on indefinite strike as a part of the JACTTO-GEO protest, the Madras High Court on Monday said that being a part of a noble profession like teaching, they should not barge onto roads and conduct agitations like labourers. "Consider giving up the agitation, at least till the exams are over," Justice N Kirubakaran said. He further added the court is refraining from passing any directions in connection with the protest since the matter has been already seized off by two other division benches of the court. A division bench of the Madras High Court had already directed the government teachers to resume work by January 25 taking into consideration the interest of the students' community. The bench of Justices M Sathyanarayanan and P Rajamanickam gave the direction while passing interim orders on a PIL petition from Gokul, a class 12 student, on January 23. The teachers and government employees, under the banner of JACTTO-GEO (Joint Action Council of Tamil Nadu Teachers Organisations and Government Employees Organisations), began their strike on January 22, urging the government to implement a charter of demands. The PIL sought to stop the strike in view of the board examinations which are fast approaching and to ensure they conduct classes and revision examinations, as scheduled. The petitioner’s counsel submitted that the State is already in bad shape because of the introduction of NEET. The situation would worsen if the strike is allowed to continue. Therefore, it is just and necessary that considering the urgency of the issue and the serious impact that it could create in respect of the lakhs of students, who are to write their board examination, the court should direct the State to take necessary steps to ensure that the strike by the teachers does not continue, he added. The protests have now mostly come to an end with nearly 95 per cent of the teachers in Tamil Nadu getting back to their jobs on Wednesday. Most schools that were closed across the State but are likely to reopen this week. Since January 22, about 2,500 members were arrested, while on Monday alone about 1,460 protestors were arrested. But on Tuesday the number of protestors decreased drastically as many government teachers and staffs returned to work as five-day protest did not earn any response from the government.